As Alzheimer's Disease Awareness Month concludes we review the state of Alzheimer's disease (AD) research, its biological mechanisms, and available in vivo research models of AD. Since the original National Alzheimer's Disease Awareness Month in November 1983, the number of afflicted patients in the US has risen from two to five million; it is projected to increase to 14 million by 20501. AD is the most common form of dementia, characterized by both physiological and behavioral abnormalities. This degenerative brain disorder is most commonly diagnosed after a steady decline in cognitive thinking skills as well as memory loss2. In most cases, initial damage to the brain occurs during the "preclinical stage", a decade before symptoms become apparent3. The second stage, when most AD diagnoses occur, is referred to as symptomatic predementia, prodromal AD, or mild cognitive impairment (MCI). MCI is characterized by memory issues that are more severe than normal for a patient's age, such as losing items frequently, forgetting important dates or appointments, and difficulty remembering certain words4. The diagnosis of dementia overcomes a diagnosis of MCI when the patient displays a significant interference in their ability to perform daily activities or function at work5. What are the Biological Mechanisms of Alzheimer's Disease? 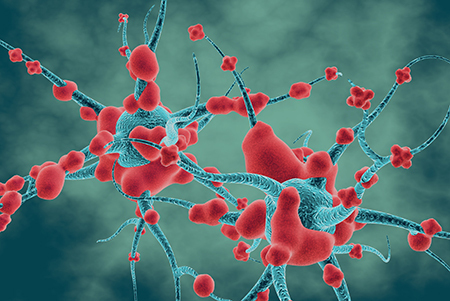 Most neurodegenerative diseases form due to the aggregation of misfolded proteins in the brain. Much like the alpha-synuclein aggregates that form Lewy bodies in Parkinson's disease, two different proteins aggregate in AD forming plaques and tangles. The first protein, amyloid-beta (Aβ), is a cleavage product of the mature protein amyloid precursor protein (APP) encoded by the APP gene. Aβ generally assembles into fibrils that aggregate on neurons, thereby contributing to cell death6. The second protein, tau, is a highly-soluble microtubule-associated protein (MAP) that is responsible for stabilizing microtubule formation. However, when the protein is hyperphosphorylated, it can form into much less soluble and much more toxic neurofibrillary tangles (NFTs), leading to the dysregulation of microtubule development7,8. Frequently, the formation of both protein aggregates begins in the hippocampus and affects the cells that interconnect with the basal forebrain, thalamus, and hypothalamus — the structures essential for forming memories9. As the proteins spread, neurons undergo cellular death, and the overall volume of the brain tissue decreases. When compared to healthy adult controls, it has been shown that the brain scans of patients with either MCI or later stage dementia can be identified due to their decreased brain tissue size10. In addition to the toxic protein aggregates in AD, the APOE gene was discovered in 1993 as a risk factor for developing the disease. The protein produced is termed Apolipoprotein E (ApoE) and is involved in cholesterol metabolism and cholesterol transport to cells throughout the body. The three polymorphisms encoded by this gene are APOE2, APOE3, and APOE4; with the APOE4 allele increasing risk of multiple diseases substantially11-14. Hypotheses about the role of this protein and the development of Alzheimer's include the idea that different forms of ApoE can bind to and stabilize Aβ plaques, and that ApoE can contribute to the development of atherosclerosis, a major risk factor for Alzheimer's15,16. Tacrine (Cognex) was the first drug to be FDA-approved for the treatment of Alzheimer's-related memory loss and cognitive impairment. Since then, four additional drugs were introduced to the market and are currently used to treat the cognitive problems of AD. Three of the drugs are acetylcholinesterase inhibitors — like tacrine — and they are rivastigmine, galantamine, and donepezil17,18. The other drug — memantine — is an NMDA receptor agonist that acts on the glutaminergic system to prevent receptor overstimulation19. While some studies claim that there is a statistically significant improvement in cognitive symptoms for the duration of the treatment, there is no medication that can delay the onset or slow the progression of AD. To expedite the rate at which drugs can be tested and approved, a database was established in 2010 by the Coalition Against Major Diseases consisting of 4,000 patients who participated in eleven industry-sponsored clinical trials of Alzheimer's treatments. The resulting database, CAMD AD/MCI, is accessible to researchers through an online portal. Later that year, the Alzheimer's Association introduced the TrialMatch® tool — which helps AD patients and healthy adult volunteers locate clinical studies with the goal of advancing drug development. In 2012, the Dominantly Inherited Alzheimer Network launched the first major clinical trial of three drugs that were developed to prevent the onset of the disease in those patients who inherited an autosomal dominant mutation in the PSEN1, PSEN2, or APP genes (ClinicalTrials.gov Identifier: NCT01760005). The first transgenic mouse with AD-like neuropathy was developed in 1995. Referred to as the PDAPP mouse, the model produced high levels of human mutant APP, which formed plaques and negatively affected the neural synapses similarly to AD20. In addition to the histopathology in this mouse, additional studies have displayed impaired cognitive function when performing various tasks21,22. Since then, many rodent models have been developed for studying AD and the Alzheimer's Disease Forum maintains a database of 160 models and the physiological conditions each model develops over time. All rodent models are then characterized as to what ages they develop each condition (plaques, tangles, neuronal loss, gliosis, changes in LTP/LTD, cognitive impairment, and synaptic loss). Taconic Biosciences offers multiple AD rodent models, including familial AD models, sporadic AD models, and three humanized apoE mouse models. While the number of rodent models now is significantly higher than years ago, the continued development of familial, sporadic, and humanized models is of paramount importance for advancing Alzheimer's treatment and research. 1. 2018 Alzheimer's Disease Facts and Figures. (2018). 2. Blennow, K., de Leon, M. J. & Zetterberg, H. Alzheimer's disease. Lancet 368, 387-403 (2006). 3. Morris, J. C. Early-stage and preclinical Alzheimer disease. Alzheimer Dis. Assoc. Disord. 19, 163-5. 4. Petersen, R. C. et al. Mild cognitive impairment: clinical characterization and outcome. Arch. Neurol. 56, 303-8 (1999). 5. McKhann, G. M. et al. The diagnosis of dementia due to Alzheimer's disease: recommendations from the National Institute on Aging-Alzheimer's Association workgroups on diagnostic guidelines for Alzheimer's disease. Alzheimers. Dement. 7, 263-9 (2011). 6. Serpell, L. C. & Smith, J. M. Direct visualisation of the β-sheet structure of synthetic Alzheimer's amyloid. J. Mol. Biol. 299, 225-231 (2000). 7. Sierra-Fonseca, J. A. & Gosselink, K. L. Tauopathy and neurodegeneration: A role for stress. Neurobiol. Stress 9, 105-112 (2018). 8. Goedert, M. Tau protein and neurodegeneration. Semin. Cell Dev. Biol. 15, 45-49 (2004). 9. Hyman, B. T., Van Hoesen, G. W., Damasio, A. R. & Barnes, C. L. Alzheimer's disease: cell-specific pathology isolates the hippocampal formation. Science 225, 1168-70 (1984). 10. Desikan, R. S. et al. Automated MRI measures identify individuals with mild cognitive impairment and Alzheimers disease. Brain 132, 2048-2057 (2009). 11. Farlow, M. R. et al. Impact of APOE in mild cognitive impairment. Neurology 63, 1898-901 (2004). 12. Chapman, J. et al. APOE genotype is a major predictor of long-term progression of disability in MS. Neurology 56, 312-6 (2001). 13. Deary, I. J. et al. Erratum: Cognitive change and the APOE ɛ4 allele. Nature 418, 932-932 (2002). 14. Corder, E. H. et al. Gene dose of apolipoprotein E type 4 allele and the risk of Alzheimer's disease in late onset families. Science. 261, 921-3 (1993). 15. Mahley, R. W. Apolipoprotein E: cholesterol transport protein with expanding role in cell biology. Science 240, 622-30 (1988). 16. Strittmatter, W. J. et al. Binding of human apolipoprotein E to synthetic amyloid ,B peptide: Isoform-specific effects and implications for late-onset Alzheimer disease. Proc. Natl. Acad. Sci. USA 90, (1993). 17. Birks, J. S. & Grimley Evans, J. in Cochrane Database of Systematic Reviews (ed. Birks, J. S.) CD001191 (John Wiley & Sons, Ltd, 2015). doi:10.1002/14651858.CD001191.pub3. 18. Birks, J. S. & Harvey, R. J. Donepezil for dementia due to Alzheimer's disease. Cochrane Database Syst. Rev. 6, CD001190 (2018). 19. Lipton, S. A. Paradigm shift in neuroprotection by NMDA receptor blockade: Memantine and beyond. Nat. Rev. Drug Discov. 5, 160-170 (2006). 20. Games, D. et al. Alzheimer-type neuropathology in transgenic mice overexpressing V717F β-amyloid precursor protein. Nature. 373, 523-527 (1995). 21. Hartman, R. E. et al. Treatment with an Amyloid- Antibody Ameliorates Plaque Load, Learning Deficits, and Hippocampal Long-Term Potentiation in a Mouse Model of Alzheimer's Disease. J. Neurosci. 25, 6213-6220 (2005). 22. Dodart, J. C. et al. Behavioral disturbances in transgenic mice overexpressing the V717F beta-amyloid precursor protein. Behav. Neurosci. 113, 982-90 (1999).